The Palazzo Vecchio (Old Palace) is a large, striking building on a beautiful square Piazza della Signoria in the heart of Florence. The palace is not far from the river Arno and right next to the most important art museum of Italy, the Uffizi. You can visit the magnificent rooms inside the palace and climb the high tower. Once the seat of the Republic of Florence, Palazzo Vecchio is still today the Town Hall of Florence. Palazzo Vecchio was built at the beginning of the 14th century. The architect was Arnolfo di Cambio. The high tower on the palace was named after him (Arnolfo tower). The palace was the central government building in Florence and seat of parliament in the time of the Medici from the 14th century. 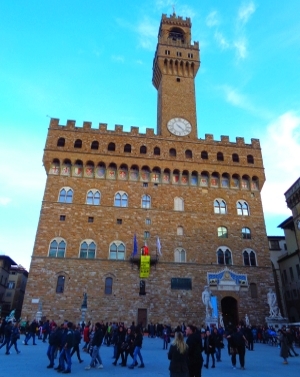 In addition to the museum, you can also climb the tower of Palazzo Vecchio. The tower is 95 metres high and you have a great view over the city centre of Florence. You can also go up to the fortress wall. There are tickets for the museum, for the wall and for the tower individually or as a cheaper combination ticket. A ticket for the museum in Palazzo Vecchio costs 10 euros, as does the ascent of the tower above the palace. Combination tickets are also available. These are the prices for the tickets on the spot at the cash desk in spring 2019. Beware of long waiting times: The queues at the ticket counter in Palazzo Vecchio are often very long. Waiting for 2 hours or more is not uncommon. On this website you can buy tickets in advance on the Internet. These tickets without queuing are slightly more expensive. For more and more big sights in Italy there are such online tickets with preferential admission. You save hours of queuing, but you pay a little more. At Palazzo Vecchio, most visitors are happy that they have bought the tickets before and don’t have to queue forever. Attention unusual short opening day: The museum in the Palazzo Vecchio is open all year round on Thursday for visitors only until 14 o’clock. On all other days, the opening hours of the museum in Palazzo Vecchio are very long in summer: 9 a.m. to 11 p.m. (April to September). In winter the opening hours of the museum are from 9 to 19. Also the tower on the Palazzo Vecchio is only open until 14 o’clock on Thursday. Otherwise, the opening hours of the tower are somewhat shorter than those of the Palazzo Museum (April to September 9 a.m. to 9 p.m., in the other months in winter 10 a.m. to 9 p.m.). Night tours to the fortress wall of Palazzo Vecchio Florence are also offered. In the palace there is a small shop with books and souvenirs about Palazzo Vecchio and other sights of Florence. In the lower area are open halls (courtyard) with beautiful walls and pillars. 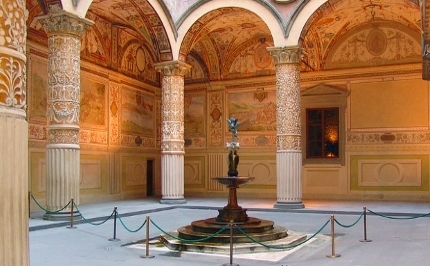 This area of Palazzo Vecchio can be visited without paying entrance fees. Hall of the 500: To visit the inside of the palace, you walk up a wide staircase. After checking the tickets, you are already in the most important, beautiful and largest room of Palazzo Vecchio. It is the gigantic Room of the Fivehundred, almost 55 metres long and 22 metres wide. The optical highlight in the probably most beautiful hall in Florence are the gigantic paintings on the two long side walls and on the ceiling. After the completion of the Salone dei Cinquecento (Room of the 500), the two greatest artists of all times, Michelangelo and Leonardo da Vinci, were painting the walls. Unfortunately, the paintings were never finished. Today, works of art by other artists decorate the hall of the 500 in the Palazzo Vecchio. You should not miss the famous statue „Genio della Vittoria“ (Genius of Victory) by Michelangelo (completion 1534, height 260 cm) on a side wall in the hall of the 500. Also on the 1st floor there are some other rooms like the apartments of Leo X. Famous is an adjoining room of the Hall of the 500, the Studiolo di Francesco I (Study Room of Francis I of the Medici ruling family). A small, beautiful room full of paintings on ceiling and walls, painted under the direction of Giorgio Vasari around 1572. The Studiolo of Francesco is so small that only 10 people are allowed to enter at a time. There are often longer queues in front of the entrance. Famous is the bronze statue Pluto with dolphin by Verrocchio. Andrea del Verrocchio was an important artist born in Florence in the Renaissance (1435 to 1485). In art, a putto is an angel in the shape of a child. From the 2nd floor, you also have a wonderful view from a gallery (balcony) into the large hall of the 500, which has a height of two floors. An ideal place to photograph the most beautiful and largest room of Palazzo Vecchio. I found the hall with geographical maps very interesting. In the middle is a large globe made of metal (about 2 meters in diameter, called Mapa Mundi in Italian), on the walls hang about 40 old maps. Many maps show different countries of Europe. The name of the room is „Stanza delle Mappe geografiche“, in English map hall. Most maps are from the 16th century and represent the world as it was then known. Other places of interest on the second floor include a chapel designed by Bronzino (the chapel of Eleonora) and the so-called „Quarter of the Elements“. In the two larger rooms, especially in the Audience Room (Sala dell’Udienza), it is absolutely necessary to look upwards, the ceiling paintings are beautiful. The ceilings in the Lily Room, the Green Room (Sala Verde) and the Hercules Room are just as wonderful. In the Jupiter room you should look at the valuable tapestries of Stradano. On the way down towards the exit, you pass through three rooms with works of art that the American Charles Loeser donated to the city of Florence. The part of Palazzo Vecchio is called „Quartiere del Mezzanino“. Most of the exhibits are from the renaissance. Known are for example „Madonna with Child and San Giovannino (Lorenzo di Credi) or „Madonna in Adoration of Christ with Saint Giovannino“ (Jacopo del Sellaio), both from the 15th century. You can walk into the tower from the 2nd floor of the Old Palace. This saves a few steps. In case of bad weather like rain you cannot climb the tower of the Palazzo Vecchio (Town Hall Tower of Florence). From the top you have a great view of Florence, the famous cathedral and the surrounding area. The Arnolfo Tower has a height of 94 meters. Climbing the tower is not easy for every visitor. For example, you should not suffer from claustrophobia or asthma and be fit enough. In the lower area there is a wardrobe. If you want to enter the interior of Palazzo Vecchio, you have to hand in your backpacks and bags here (free of charge). Only smaller bags like handbags up to a certain size can be taken. There’s a bathroom behind the dressing room. This toilet can only be used with a ticket. This also applies to the inexpensive drinks machines (90 Cent 0.5 litre water bottle), there are also snacks. Without a ticket you can go to the bookshop in Palazzo Vecchio. There is a larger selection of books on Florence, some are also available in English. In the shop you will also find souvenirs like the David by Michelangelo as a small figure made of plastic, postcards, printed coffee cups and so on. Flash photography is not allowed at Palazzo Vecchio. In front of the entrance to Palazzo Vecchio is the sculpture of David by Michelangelo. It is the most famous work of art in Florence and probably the most famous sculpture in the world. Today there is a copy of David, but it is difficult for normal people to distinguish it from the real statue. 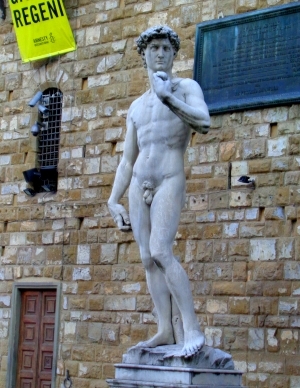 The original David by Michelangelo can be seen in the Galllery dell’Accademia (also called Accademia di Belle Arti) in the northern city centre, about 1 kilometre from Palazzo Vecchio. Many other world-famous sculptures stand in front of Palazzo Vecchio and in an open hall next to the Palace building. World famous is among others „Hercules kills Cacus“ by Baccio Bandinelli. The huge square Piazza della Signoria in front of the Old Palace (Palazzo Vecchio) undoubtedly belongs to the really big squares in Italy. One of the sights is the beautiful fountain (Neptune fountain) of Bartolomeo Ammanati from the 16th century. Unfortunately, this fountain was just renovated during our visit in November 2017. 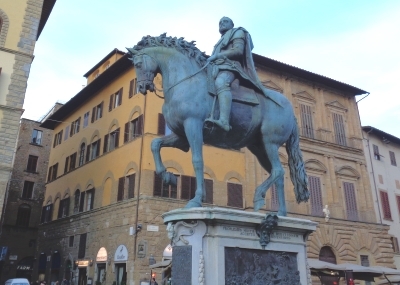 The centre of the square is dominated by the equestrian statue of Cosimo I de Medici. From 1537 he ruled Florence and the Duke of Tuscany for several decades. The bronze statue in Piazza della Signoria in Florence was created by Giovanni Bologna between 1587 and 1594, after the death of Cosimo I. The bronze statue was the first of its kind in Tuscany.